This week: OLEDs are never going to catch up, hens lay more eggs under LED lights, and Zhaga takes on COB LEDs. Proposed Zhaga standard sizes, in mm, for chip-on-board LED arrays. Many outlets are reporting that the Zhaga Consortium has begun work on a new Book to bring some order to the wildly nonstandard world of COB LED arrays. Apparently, Zhaga decided to take on the challenge after requests from many of its members -- lighting manufacturers, makers of holders or fasteners, and the like. Those making the COB LEDs were not asked whether they would like to abide by any standards, and now they have to decide whether they want to buy in. "The Book will define LED light engines comprising rectangular and square LED modules with a circular light-emitting surface (LES) and a separate LED driver," Electronics Weekly reported. It listed the proposed standard sizes of overall COB arrays (pictured). This is about the only aspect that has been decided so far, and even it is subject to change. Also under consideration for specification: attachment (adhesive, screws, or a connector holder), hole size and placement (optional), electrode position and size, and the location of the thermal measuring point. The sizes of the LES will be as laid out in Books 3, 5, 10, and 11 covering spotlight modules, but the new standard may specify center-point positions. The international testing organization has announced it is the first to provide LED driver testing to the Underwriters Laboratories Class P standard. Class P refers to UL-defined thermal protection standards, originally for fluorescent ballasts, that prevent overheating conditions. LED drivers need such thermal protection, as well. I looked over the website of Intertek's main competition in the LED testing arena, TÜV Rhine­land, which launched a comprehensive lighting testing service in May, focusing on LEDs. I found no sign of UL 935, Class P, or any mention of driver testing. Lux Review reports on an IHS market study that makes the bold claim that OLEDs will always trail LEDs in the lighting market. (I failed to find any trace of the study itself on IHS's site, but I'm sure a salesperson could connect you with it.) While OLED technology is advancing by leaps and bounds, the LED side of the house is not standing still. The OLED market is tiny today -- only $2.6 million, according to IHS. It is expected to experience rapid growth, to $27 million in 2020, but it will still be dwarfed by LEDs. The worldwide market for inorganic LEDs will be 4,000 times as large in 2019, according to a BCC Research report. 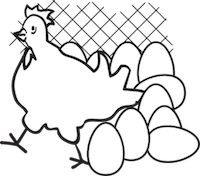 WorldPoultry.net is reporting on research out of Brazil that compared the productivity of hens laying eggs under incandescent light or LED light colored red, blue, green, yellow, or white. Workers at the Federal University of Grande Dourados segregated 360 hens ("Isa Brown layers," we are informed) into isolated environments and ran randomized tests using the six varieties of lighting for four periods each, then repeated the whole procedure twice more. Egg production (%) was significantly different (p<0.05) among treatments, with the best results obtained with red LED, white LED, and incandescent light sources. Egg weight, feed intake, and internal egg quality (albumen height, specific gravity, and Haugh units) were not influenced (p>0.05) by light source. The research was published in the Proceedings of the 2014 International Poultry Scientific Forum in Atlanta. The paper is openly available.